I’ve nearly finished reading Last Post: The End of Empire in the Far East, by John Keay, which I mentioned in a recent post. History is about understanding past events, processes and trends, and learning from them. Various European countries were involved in the Far East for hundreds of years, firstly for trade purposes, and eventually they administered territories as colonies. Then along came World War II and Japanese invaders. The colonials fought a little, but mostly ran away (leaving the locals to their fate) or surrendered. The Japanese showed that the colonials were not invincible, but they in turn were usually pretty nasty to the locals, and especially those of the Chinese origin. In many of the islands, the Japanese were never beaten, but instead surrendered as a result of the two atomic bombs dropped on Japan. For a while after hostilities ceased, the allies sometimes retained Japanese troops in situ, in order to maintain order. So, what was to happen when the Europeans began to return? Had they not been fighting against oppression, and for the right to be free? Was this not also to apply to the indigenous populations of Tonkin, Cochinchine, Sumatra, the Malay States, Borneo, Sumatra, Bali, and the other islands? In many cases, no, or at least not for some time. As a result of the war, transport and communications in the region had changed radically. Distances had telescoped as aircraft were upgraded and operational ranges extended. Landing strips had been created in all sorts of places. The Japanese had used prisoners-of-war and forced labour to push roads and sometimes railways into previously impenetrable terrain. Thousands of Jeeps and numerous liberty ships, Dakota transport planes, and landing craft (used for inter-island ferries) transformed transport after the war. Armaments were everywhere. These were big changes which had a profound effect on the local populations, who were no longer cut off from each other. They were now much more able to communicate with each other. Concepts of nationalism began to gain ground, though the make-up of the emerging nations was up for discussion. The Wiki entry for the South East Asia Command (SEAC) points out that, after the War, “The Allies found that their war-time allies in the Viet Minh in Indochina, and Indonesian nationalist forces in the East Indies, were well armed, well-organised and determined.” I’m not sure about them being particularly well-organised, but they were often armed, they were usually determined, and their societies and expectations had been changed forever by the war. At the same time, SEAC were sometimes not 100% sure about the loyalty of their British Indian detachments in operations in this part of the world. In some cases, the reassertion of colonial control resulted in tragedy. In Surabaya (part of what became Indonesia), British troops rescued some Dutch people who had been taken prisoner by locals. The locals reacted and attacked a force commended by Brigadier Aubertin Mallaby, who was killed along with several Eurasions. Despite Sukarno calling for calm, the SEAC forces bombarded the town, killing several thousand people, with the battle lasting several weeks. The Surabaya incident gave a massive boost to Indonesian nationalism and became known as Hari Pahlawan (Heroes’ Day). Elsewhere, things were not so bad but there was trouble in Bali until 1948. At around this time, people wondered whether the nationalists or Communists would prevail, but it was actually the new Republic that crushed a Communist revolt. Nationalism and communism were two big themes in this part of the world at that time, and it is fascinating to see how they interacted, and how different countries developed in very different ways. In Indonesia, large numbers of communists were killed by other Indonesian groups on more than one occasion. I don’t know much about Korean history, and it isn’t really covered by Keay’s book, but we know that there was a nasty war there, ending up in a division between the communist north and South Korea with a capitalist culture. Elsewhere, in French Indochina, nationalist and communist forces more or less joined together to fight against firstly the French, and then successfully against the Americans. In Malaya it was quite different. During the “Malayan Emergency“, Commonwealth forces fought and defeated the communist Malayan National Liberation Army. Later, during the Communist Insurgency War (Second Malayan Emergency), it was the Malaysian Government security forces who fought the Malayan Communist Party. The big difference in Malaya was that whilst the communists were largely made up of ethnic Chinese, most Malays were nationalists and supported the government because they feared a takeover by ethnic Chinese. The final conflicts there ended at about the same time as the collapse of the Eastern Bloc regimes in Europe. So, we have very different outcomes in those four countries, plus a further different path in the Philippines. I am not clever enough to draw possible analogies with the current situation in the Middle East, apart from saying that American bombing of Vietnam and Cambodia didn’t have the desired effect, so it may turn out be the same with Syria. It is sobering to think that the tonnage of explosives dropped on North Vietnam in the 60s was three times the total dropped worldwide during World War II. Getting back to South Vietnam, at one stage in the early 60s there was the ludicrous situation whereby supposedly in the name of freedom, democracy and self determination for all, the Americans were supporting an unelected, nepotistic, corrupt and unpopular puppet administration which only just below the surface had fascistic tendencies, whilst Hanoi, supported by Peking and Moscow, claimed to be fighting to liberate South Vietnam from US imperialism. Sarawak has a very peculiar history, which I’ve mentioned previously on this blog. In Sarawak, the various emerging left-wing groups in the 1970s and 80s sound like something out of a Monty Python movie. There was the Brunei People’s Party, the Sarawak People’s Guerilla Force, the North Kalimantan People’s Army, the Sarawak Liberation League, the Sarawak Advanced Youths’ Association and the Malayan Communist Party. Despite being partially anti-communist at home, Indonesia supported some of these groups, and then changed sides and fought against their former allies. Three external developments which influenced politics in the Far East during this period included the belief in the West that communism had to be stopped somewhere, otherwise it would spread and spread, eventually to Australia and beyond; Indian Independence in 1947 which showed that Britain was serious about allowing its colonies to become independent; and the rise of communism in China. To commemorate the anniversary of the Battle of Sheriffmuir, Shaun and I visited the battle site, on a particularly cold and wet afternoon, 300 years ago to the day after the event. We happened to arrive just as members of the Macrae Clan were holding their own commemoration. The two men seen in the above short video were discussing the battle, in gaelic. A piper played a lament to the fallen Macrae clan members. The battle of Sheriffmuir was part of the Jacobite rising of 1715 (also known as the Fifteen). It was not decisive for either side, but the Jacobite forces were prevented from marching further south after previously having taken Perth. When the Old Pretender later landed on Scottish shores on 22 December 1715 he could not raise sufficient forces and quickly returned to France. The rising was part of a series of rebellions and attempted invasions between 1708 and 1745, culminating in the Battle of Culloden in 1746. France, and sometimes Spain, helped to bankroll many of these risings. It wasn’t a good week for the Jacobites, as their supporters were beaten at the Battle of Preston. It may not be widely known today that there were numerous Jacobite supporters in England. This is the first of my Christmas cactus (Schlumbergera) to flower this year. 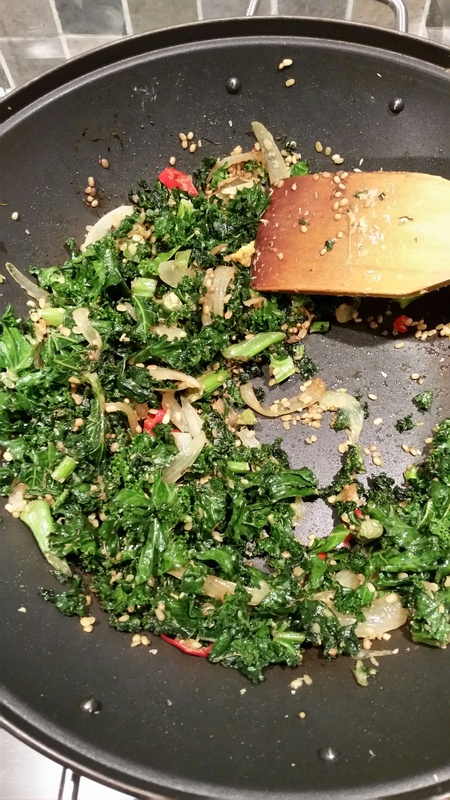 In a wok fry mustard seeds, onion, chilli, urid dal, fenugreek leaves, and tumeric, then add kale and some desiccated coconut and some soy sauce. There’s a scene in the movie Red Army where an ex-KGB operative is being questioned about his past role in preventing members of the Soviet ice hockey team from defecting to the west during their trips to play in the Olympics. His young granddaughter is sitting beside him on a bench in a garden outside what may be his house. He begins to speak about the past when the child, who is obviously a bit bored, interrupts and asks him why he is wearing dark glasses which surely prevent him from seeing her. No, he points out, he can see her quite clearly. She goes on to tell him that she too has some dark glasses with white frames. Eventually, after several similar interruptions, he gets back to the point he was making to camera. The directors left the scene uncut, and it actually adds quite a lot to the movie because it shows that everyone, even ex-KGB, has a human side. The movie is a documentary about the successful Red Army hockey team placed in the context of Soviet Union politics before and after USSR changed to Russia. It is partially based on interviews with Slava Fetisov. Very interesting because it shows how, in those days, politics influenced sport both in the USSR and USA. Sports representatives in both countries saw sport as the epitome of their societies. The examples shown of Soviet art (on posters, etc) are also impressive. The other movie I saw this week was Beats of the Antonov, which was part of series of African movies being shown recently in Edinburgh and Glasgow. It is another documentary, this time about the effect of Sudanese government bombing raids in the Blue Nile and Nuba Mountain regions in Sudan. An ethnomusicologist makes recordings of the songs of the area, many of which are performed in response to the conflict and in an attempt to retain the local culture. The present conflict in this part of the world is sometimes known as as the Third Sudanese Civil War. The same, or similar groups in the region have been fighting for a long time. As far as I can see, it’s basically an ethnic conflict between groups of Africans and Arabs, complicated by all sorts of other issues. In November 1983 Lindsey and I were in Khartoum, aiming to go overland to Kenya, but the Second Sudanese War suddenly flared up and travel permits were stopped. We ended up going to Kassala in the east of Sudan for a week instead, and then flew from Khartoum to Nairobi. This was probably just as well, as the route south of Khartoum was very rough. 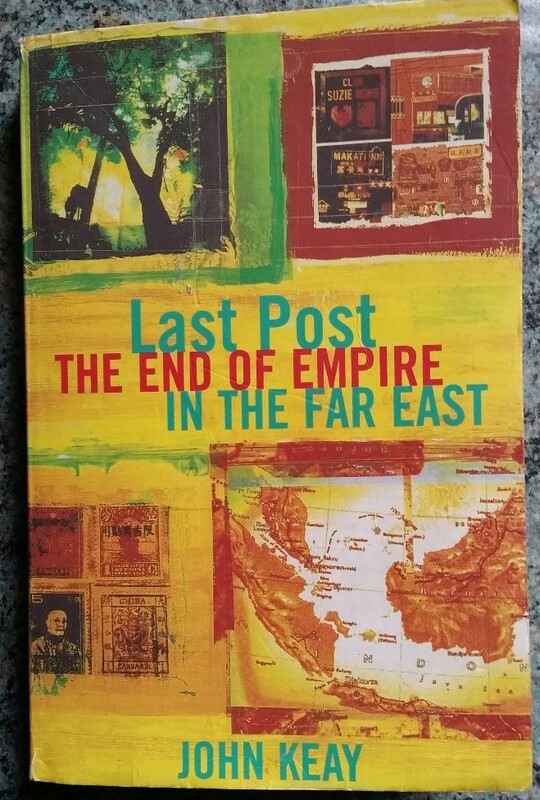 I’ve been trying to fill in some of the many gaps in my knowledge about Southeast Asian history by reading Last Post: The End of Empire in the Far East, by John Keay, published in 1997. I didn’t previously know about the huge French losses at and after the Battle of Dien Bien Phu in 1954, during the First Indochina War and that over 11,000 French and Vietnamese prisoners were taken by the Viet Minh. I didn’t know that there were places called Dinding, Balambangan and Weihaiwei, the last of which was once controlled by the British. I had not known that the man who had tracked down the Apache leader Geronimo, Major-General Henry W. Lawton, was also involved, and killed, in the Philippine–American War of 1899-1902 by a Filipino sharpshooter, ironically under the command of a general named Licerio Gerónimo. In fact, I had not known how vicious that war was, with over 4,000 American and 20,000 Filipino deaths (many more Filipino civilians died). After that war, the Americans tried a policy of attraction, with almost limitless opportunities and privileges for Filipinos, a policy later criticised by P.W. Stanley as “…nation-building without regard to nationality.” I had previously briefly read a bit about Ho Chi Minh (Nguyen the Patriot), but didn’t know about his fascinating early life. The book confirms that “The [British] empire was essentially the product of individual initiative aided by the threat, and occasional use, of force” rather than an ongoing policy of expansion. It describes the different colonial cultures of France, the Netherlands, Spain, Great Britain and the USA in the area. The Dutch saw their colonies as an exercise in resource management. Other powers saw their empires in terms of tutelage, partnership or possibly even brotherhood. The French flag belatedly followed their missionaries. The British were always concerned with strategic protection of trade routes.